Hackensack, NJ, November 2014 – LiveU (www.liveu.tv), the leader in portable live video acquisition, contribution and management solutions, today launched the LiveU Community platform (http://www.liveu.tv/community), a cloud-based network connecting freelancers, production houses and other service providers with hundreds of top broadcasters around the world. Using its own management technology, LiveU has created an online news exchange platform, making it simpler and cheaper for LiveU customers to offer or request newsgathering services for breaking news and events anywhere, at any time. With the LiveU Community, LiveU uplink devices can transmit to any LiveU server, essentially allowing the broadcaster to use any service provider’s unit as one of their own. Leveraging the massive deployment of LiveU units and servers around the world, LiveU Community enables LiveU broadcasters to find LiveU-equipped professionals in any geographic location and create unique content at a significantly reduced cost, and much faster, than sending their own news crew or using satellite or microwave equipment. 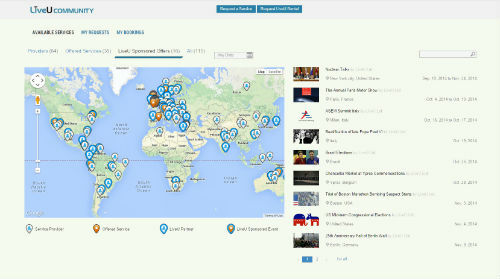 LiveU (www.liveu.tv) is the leader in portable live video acquisition, contribution and management solutions. LiveU's award-winning technology enables live video transmission (HD and SD) from any location around the world. With top-tier customers in 60+ countries, LiveU’s solutions are being used for breaking news and high-profile events, such as the FIFA World Cup™, Winter and Summer Olympic Games, US Presidential Campaign, Royal Baby, Hurricane Sandy, Super Bowls and US Collegiate Championships. From backpacks to smartphones, and satellite/cellular hybrid to external antenna solutions, LiveU offers a complete range of devices for live video coverage. LiveU’s solutions include multiple 4G LTE/3G, HSPA+, WiMAX and Wi-Fi cellular links, which are optimized for maximum video quality based on the available network conditions.